Why eliminate the rear sway bar to clear 15" wheels when you can relocate the mount. New from UPR is this Rear Sway Bar Relocation Kit for your 2005-2014 Ford Mustang. 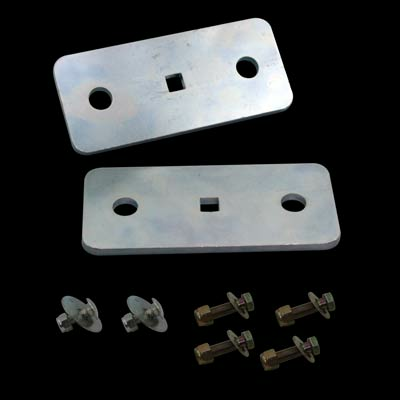 This kit relocates the mounts for your rear sway bar on the rear end giving you more clearance for smaller drag wheels. Installs in 45 minutes or less with supplied hardware. Some minor cutting is required. 2005 2006 2007 2008 2009 2010 2011 2012 2013 2014 Mustang 4.6L 5.4L 5.0L Coyote 4V 3V V8 GT GT500 Shelby Steeda Saleen and Roush Vehicles. No one else can stack up to the bold clean styling of our aftermarket Billet dress ups, Street Strip & Racing Suspension & Performance Parts for your late model American Muscle Car!